I was going to do Duelist next, but since everyone has already started on Soldier.... here we go. 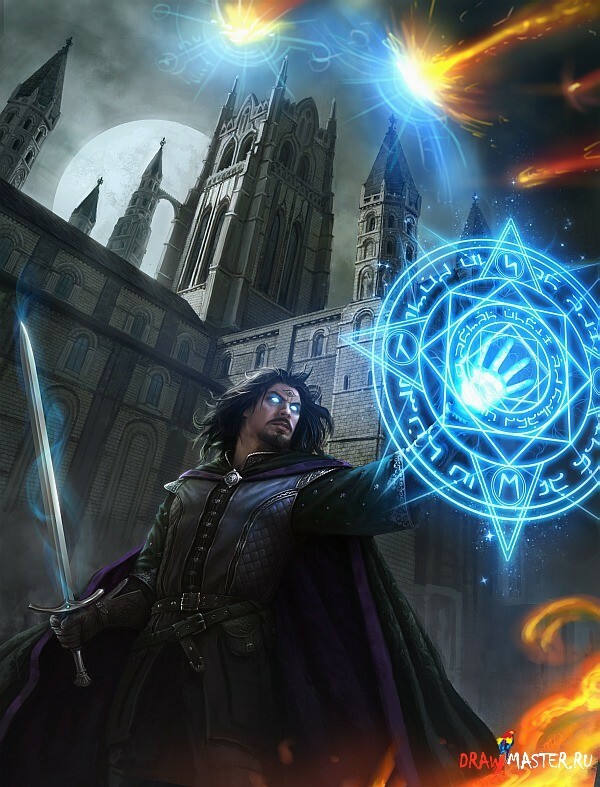 Irresistable Command (9th): Simon Spell, autocast. Uses: 1/2 level. Aura of Defense (7th): All allies within melee distance of the Soldier get a +3 to armor (Stacking: Damage). Uses: Level. Aura of Confidence (8th): All allies within melee distance of the Soldier get a +2 vs LI (Stacking: LI). Uses: 1/2 Level. Bull Rush (8th): Throw. Uses: 1/2 Level. If we're relocating the Soldier discussion here, I'll cross-post my notion from this morning. The soldier's command of tactics includes choosing advantageous formations for facing different types of foes. The soldier may switch formations at any time while the ability is active; this takes 5 seconds and is subject to the 5-second rule. Level 1-Phalanx: A tightly ordered defensive formation, the phalanx enables allies to protect one another. All allies within 10 feet of the soldier gain 1 point of effective base armor. This protection increases to 2 points at 5th level. Level 5-Turtle: The turtle formation is a classic defense against massed volleys of arrows. Strategic positioning and placement of shields reduces the damage from incoming missile weapons for everyone in the formation. All allies within 10 feet of the soldier gain 5 points of Missile Protection. Level 10-Fireball Formation: Sometimes the best defense is to spread out the potential targets, minimizing the number caught in an area attack and allowing the targets room to take cover. While this formation is active, all allies who are at least 5 feet away from any other ally gain 10 points of protection versus area of effect attacks, as Monk Additional Armor vs Area Effect Attacks. The numbers are pretty fuzzy; I made them relatively low because these are AOE buffs, and because two of the buffs are to base armor. If they're not base, the numbers could be higher, but need to remain lower than equivalent-level single-target effects (e.g., the Fireball Formation buff should never be as much as an equal-level monk's innate AOE armor). Feel free to add other formations or tweak the numbers, if you're interested. I like the idea of abilities that grow as you level, if you haven't noticed. Also, it's easy to get drawn into coming up with nifty high-level stuff and forget about the low levels, so devising a progressive abilities forces me to throw the lowbies a bone or two. Remember that all of these classes start at 6th level and go to 10th... so there ARE no 1st level Soldier SAS. Steely Stare 6th, uses 1/2 level a day. The Soldier is able to cow a lessor opponent with his fixed gaze. The Soldier calls out "Steely Stare level X!" at the target. if the target is affected they are unable to attack or move towards the Soldier as long as the Soldier keeps looking at them. The soldier may continue other activities at the same time, as long as they keep looking at the target. They stare's effect is broken if the soldier attacks them, or if the targets LI is raised higher then the stare. Duration, until the stare is broken or the soldier ceases to look at the target. Legends tell of mighty soldiers heroically holding their foe at bay for a day and a night until sleep has overtaken them. Soldier's Saving shove 7th, uses 1/2 lev per day. A soldier may push a ally out of the way a attack. When a ally within arms reach of the soldier is the target of a attack (melee, magic, trap) the Soldier can knock them down and spare them the effect. The Soldier calls out " Target, Shove knockdown!" and the target suffers a knock down from the Soldier's shove but is spared the effect. The shove must be called IMMEDIATELY after the effect to work. If the 5 second rule prevents the soldier from using the shove right away, too bad! Oh man! Steely Stare is fantastic!!!! I really love abilities that have in-game mechanics (keep the stare connected) rather than arbitrary ones (30 seconds). Nice work!!! Missile defense 8th, uses lev per day. The soldier may by use of their shield, weapons, armor to knock aside any missile attacks in their field of vision except a Arrow of slaying. The Player must roleplay this action while calling out "Knocked aside!" Missiles targeted at the soldier or anyone within arms reach of the the soldier may be "knocked aside". But if they are unable to roleplay the action it due to combat, rope course etc... they cannot use the ability. If they cannot readily see the source of the attack they cannot use the ability. Yeah Im open to anything for shove, how about "knockdown miss!"? Taunt 6th, uses 1/2 lev per day. The Soldier's is able to provoke a unwary enemy to attack with his jibes and insults. The Soldier roleplays making a comment to the target, then says "Taunt Level X!" If affected the target must try to attack the Soldier immediately, after the target has successfully attacked or been damaged by the Soldier they may stop attacking if they choose. The target must be able to understand the Soldier's comments for the taunt to have effect. If the target is to high level or unable to understand they must reply "no effect"
Scoff 7th, uses 1/2 lev per day. The jaded and worldly Solder know when and when not to fight, and is not provoked easily. The Soldier is able to negate a Taunt directed at themselves or allies with a quick quip or even a simple snort of derision, keeping tempers calm. The Soldier must roleplay the comment or laugh and then declare "Scoff". The Scoff ability is not LI affected, wise soldiers quickly learn to not attack superior foes until the time is ripe. Keep in mind every soldier has more taunts at his disposal then scoffs because after all you can only put up with so much trash talk! Stone Steps 8th, uses 1/4 lev per day, round up. When necessary The Soldier may choose to make a stand, be it to save himself or buy others time. The Soldier roleplays setting their shield, or digging in there feet, etc.... Then calls out "stone step", Thereafter the Soldier is able to resist knockdown effects, as long as they do not move their feet and retain the use of both legs they will respond to any knockdowns with "resist knockdown". If they move their feet or lose a leg they can no longer resist knockdowns. Many the unwise Goblin has been broken on the shields and weapons of a Dwarven Soldier who has chosen to guard a bridge or even bloody patch of ground for themselves or in the defense of others. Second Strike 7th, uses 1/2 lev, The skilled and patient Soldier waits looking for a opening and striking like a adder when they see it, making their opponent pay dearly for their lapse. The Soldier can strike for damage twice for one hit. Upon making a hit the Soldier calls out "X, X Second strike" the target treats it as two separate hits, in regards to reducing damage, and the one point rule. Second strike can not be used to double any other fighter blows, and can only be used in hand to hand strike not missile attacks. Storm of Strikes 10th, uses 1 per game day. When the moment comes the Soldier knows what they must do to turn the tide of battle, be it calling on a inner rage, or petranatural focus or just, or a secrect of their orgin, however the Player wishes to roleplay it. The Soldier declares to the sk or gm "Storm or strikes", from that moment forward till the end of the combat the Soldier will call out double strikes as in Second Strike for every successful hit. The Soldier must be in continuous melee to maintain the Storm if the GM or Sk percieves a lapse in the combat they may inform the Soldier that the Storm has expired, otherwise as long as the soldier is engaged, striking a blow at least every few seconds or moving at their best speed to engage more opponents the Storm of Strikes will continue. Wise allies will endeavor to steer opponents into the range of the Stormingsoldier. While Storming the Soldier can be knocked down, but this in itself will not interrupt theStorm, nor will losing a limb interrupt the Storm, being reduced to unconsciousness will end aStorm of Strikes. Helping Hand 8th, uses 1/2 lev per day. Always aware of his allies and brethren in arms whilst in combat, The Soldier ready to lend a hand lest someone be disarmed. If a target is disarmed by dropsy, disarm, etc yet still has the use of one are the Soldier will with a quick flick of their weapon restore their weapon to them. The Soldier must strike the dropped weapon on the ground and mimic flicking it to the target and call out "Helping Hand!" while making some type of statement that the target should be more careful, or pay more attention, player should role play this. The target may then pick up their weapon and continue as though they never dropped it, ignoring time restraints of retrieving the weapon. Of course if the target has run away, or cannot reach the dropped weapon the Helping Hand is wasted. For taunt. Would the target have to hit the soldier or just attack? I'd vote the latter, but the former would be a lot more powerful. Second Strike... the computational aspect makes me nervous. Each hit already carries so much mental effort to track, the doubles will be perhaps harder. I love the idea of Helping Hand, but at 8th level there are no abilities that can make you drop your weapon for more than a second anyway, right? Stone Steps is a nice one! Again I like the in-game mechanic aspect. Maybe allow them to pivot on one leg? Blood Brethren 7th, The Soldier may share a portion of his recovery with a ally. When a Ally is injured the Soldier may clasp hands with, or embrace, or some other form of comfort. While telling the target that their damage is not so back, or comparing wounds, basically giving encouragement and succor to their ally. This process and roleplaying takes 1 minute as per normal recovery at which point the Soldier states how much of his recovery he has used and splits the results with the target. So a recovery of 14 points would heal 7pts for the Soldier and 7pts for the target. Blood Brethren has the following constraints, the target must be conscious and aware of the Soldier, it can not be done in combat, and the target must be a "Blood Brethren", Someone who the Soldier nominated as such at the beginning of a game day. The Soldier may nominate 1/3 per level characters to be his "Blood Brethren" The Soldier must roleplay the interaction with these nominated "Blood Brethren" at the beginning of the game day. The roleplay does not have to be verbal, and the Soldier does not have to tell the Nominee that he has named them as such. nor do they have to agree to it. The Soldier does however have to tell their GM and SK who the soldier has made "Blood Brethren" for the day at the beginning of the game day, otherwise the Soldier will not be able to use "Blood Brethren" until the next game day. I envision they would just have to attack, at that point they can regain their senses and back off if they want to! requiring a hit could lead to some pretty silly encounter breaking I think. This way it is a clean quick mechanic that a good team can take advantage of, or a mediocre team can fumble. Don't force the outcome, just give a chance, my favorite type. I think a pivot would be okay in theory but might lend itself to a bit of "traveling" like in basketball, but It could be cool. Yeah I get your point with Second Strike, By keeping it the same amount and enliminateing special strikes you lesson the lmath oad. By requiring the call out of "second strike" with the damage you can slow down the Machine gun, hopefully knowing your armor amounts works quickly for both hits instead of trying to refigure the math if the Soldier used a ability to jack up his damage for one hit and then call out different damage at other hits. Just a thought. Also I should have put in that a Soldier can not Helping Hand himself. I also kept calling it Shaving Shove in my head. It was pretty funny for a while. I love the flavor of it. I'm always a little worried about any SAS that your target has to know rules for. I love abilities like Stone Steps and Missile Defense because of that. Taunt has always been a great concept. Good write up! I agree with Jeff that tangible components are always better than timed abilities.